// Can a Criminal Attorney Help With an Assault Charge? Assault charges are very common offenses, and frequently weighted more heavily than the situation calls for. New York criminal attorneys can help clients defend themselves against assault charges that may be incorrectly charged. Article 120 of the New York Penal Code defines how these charges are determined and their penalty designation. An assault charge can range from simply a violation up to a class E felony (felonies in New York are assigned in descending weight from class A to E). Some of these charges have varying degrees themselves. Stalking, for example, has four degrees which can range from a misdemeanor up to a class D felony depending upon the severity and circumstances surrounding the charge. Educating yourself on the particular assault charge you are facing, and any potential degrees associated with that charge, can help your criminal attorney establish a viable defense and potentially negotiate a lesser charge. An attorney can also find possible ways in which the charges initially applied may be deemed as too severe. For expert advice tailored to your specific case, the best approach is to get in touch with a New York criminal attorney with experience in assault charges. 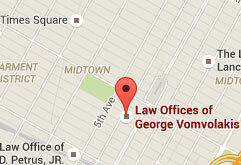 To set up a consultation to discuss your case details, contact the law offices of George Vomvolakis via e-mail at gvomvolakis@vomlaw.com, by phone at (212) 682-0700 or at his office at 275 Madison Avenue, 35th Floor, New York, NY 10016.